A couple of months before our (short) trip to New York, my husband told me to look up a particular restaurant that he saw on a list proclaiming which eateries had the best fries in the United States. Since he knew we would be going to New York, and this particular restaurant was in New York and caught his eye, he was trying to convince me to give it a try. This hip, funky place apparently had developed quite a reputation, not just for its fries, but for its eclectic mix of food options in general, in particular the burger and fries dish that my husband had read about. After scoping out the restaurant’s location, I realized that this would be the perfect lunch spot for us after having spent the morning wandering around the High Line. Work up an appetite and grub on good, greasy food? That works for me. 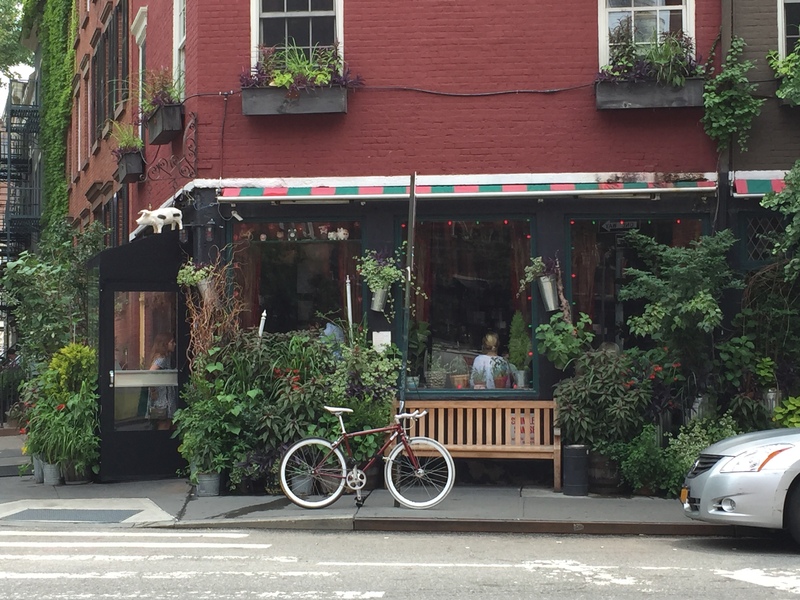 Located in the hip and trendy Chelsea neighborhood, just downtown of the end of the High Line, The Spotted Pig is a cute, 2 story, restaurant and bar, or gastropub, if you like, located in the middle of a residential neighborhood. If you didn’t know better, you’d walk right by the restaurant and never have a clue what was hidden behind the doors. In fact, the restaurant (as far as I could see), didn’t even have any sort of posted signage along the outside indicating that it was an eating establishment or what the name of the establishment was other than a small pig figurine hanging over the front doorway. Otherwise, it looked almost like any other residence located along the same street in the same neighborhood. Owned by chef April Bloomfield and her partner Ken Friedman, this cute and kitschy restaurant which doesn’t take reservations and only seats about 100 people packed in tightly over 2 floors, with a fully-stocked bar on both floors, proclaims to serve seasonal British and Italian fare using local ingredients when possible. Decorated with pig paraphernalia all around, as well as potted plants, and other “farm-style” decorations, stepping inside, you feel like you’re transported to a whole different world. 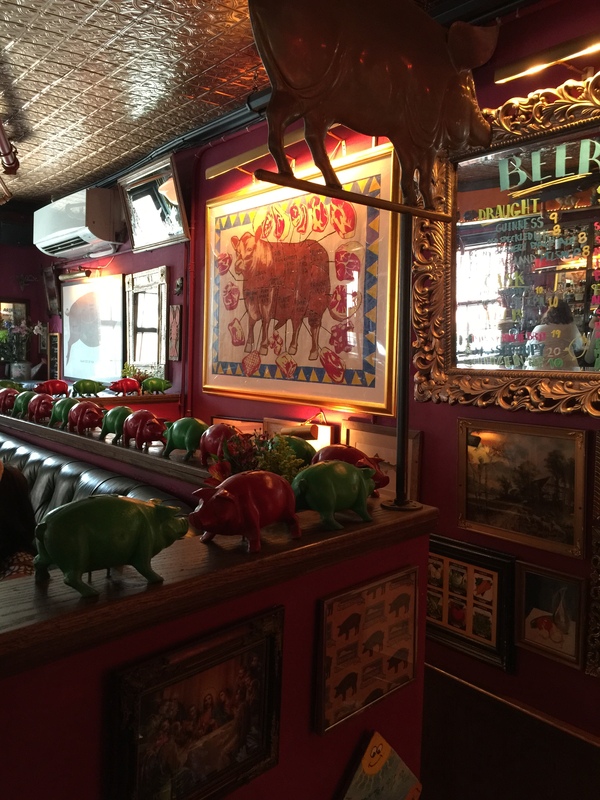 Opened in 2004, The Spotted Pig became New York’s first gastropub. In 2014, Chef April Bloomfield won the esteemed James Beard Award winner recognizing her as the best chef in New York. 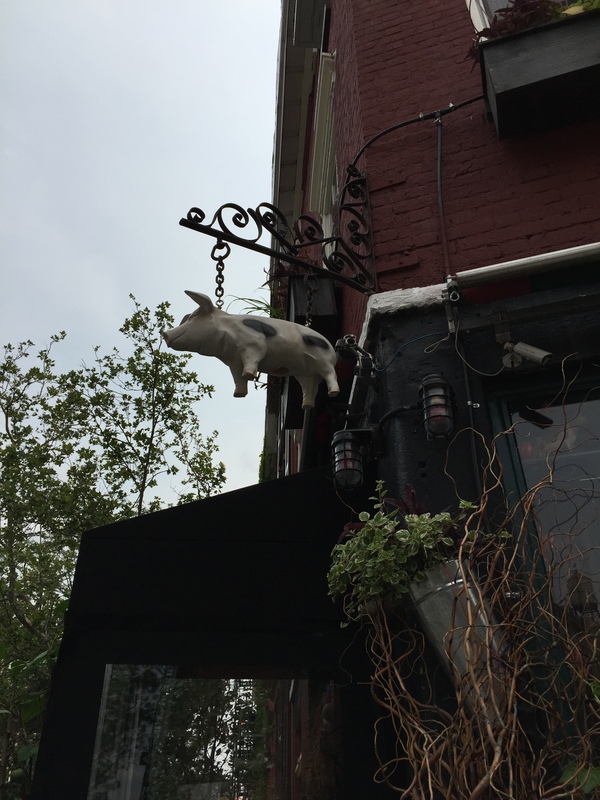 In fact, The Spotted Pig has received one star from the Michelin Guide seven years in a row. My husband wasn’t initially going to order anything to drink with his meal until he saw the restaurant’s beer menu. 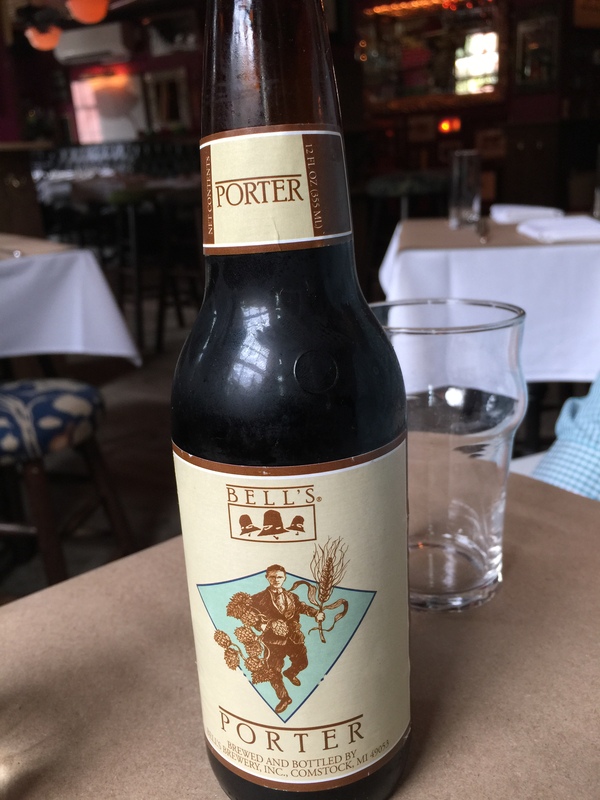 The Spotted Pig was offering a beer that my husband has always liked out of Kalamazoo, Michigan called a Bell’s Porter. Reminding him of his college days when he was first introduced to this beer, he couldn’t help but reminisce the good old days by ordering a bottle to go with his burger and fries. Of course, it didn’t hurt when I told him to go ahead even though it was only lunch since we were on vacation, and we were walking all over the city, so it’s not like he had to worry about driving. 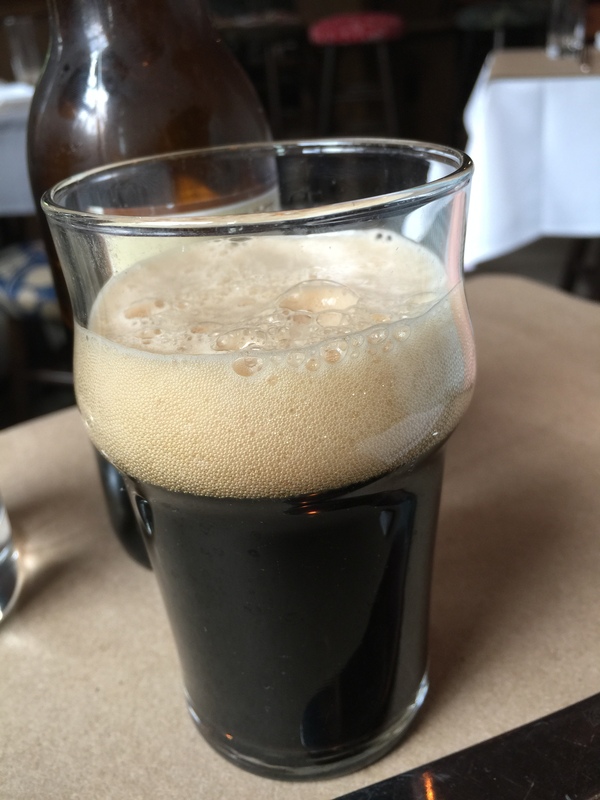 With hints of dark chocolate and fresh roasted coffee, this darker beer which emphasizes the darker, roasted qualities of malt hit the spot for my husband. Originally, I was going to order the one item on the menu that put this restaurant on the map. However, my husband was interested in ordering it too, and we kind of wanted to sample different items. So, after our waitress told us what the daily specials were, I changed my order to one of the specials. 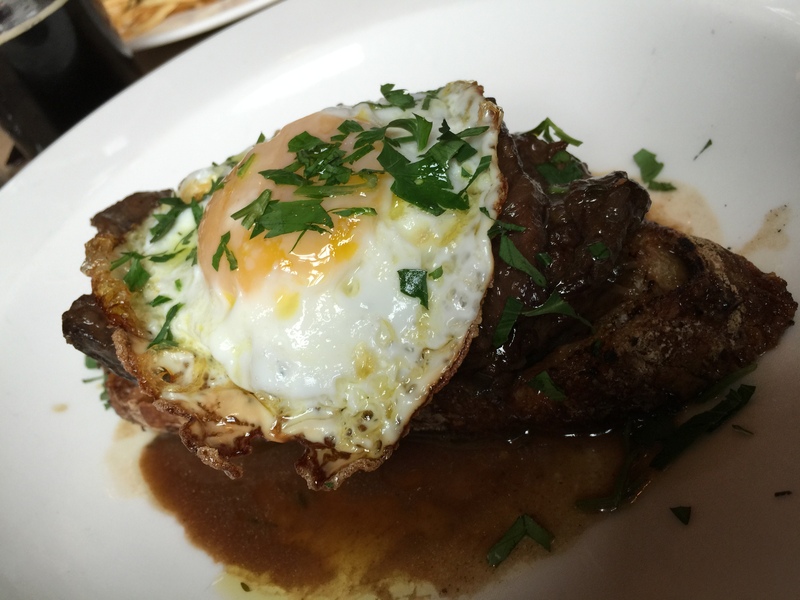 Braised beef on grilled toast with a fried egg. I’m a huge fan of pot roast, braised beef, short ribs, etc. Anything that’s been cooked low and slow for a long period of time to break down the fat and the tendons in the meat is always going to be something I love. This dish was no different. The braised beef was out of this world! It was incredibly rich and savory served with the juices in which it was braised. Cracking open the egg and watching the egg yolk ooze out and mix with the braising juices with the beef was so luxurious and tasted amazing. Of course, the amazing toasted bread underneath that soaked up all of the juices and the flavors. This was such a terrific dish, and I’m so glad I tried it. When a restaurant is known for having some of the best fries in the country, and it’s that fact that even drew my husband’s interest in this restaurant, you know there’s no way he’s not ordering the burger and fries. This is the dish that The Spotted Pig is known for, and the one dish that is most often ordered. However, be forewarned, with reservations not being taken and the restaurant being on a first-come, first-served basis, the tiny kitchen is often overwhelmed with orders for these burgers. Luckily, we arrived at The Spotted Pig not long after it opened for lunch service, so we were fine, but we heard our waitress tell others who came after us that due to the fact that The Spotted Pig was a Michelin-star restaurant and they had a tiny kitchen, they could only cook up about 5 burgers at any given time. That meant that there could be quite a lengthy wait for food if that’s what you desired to order. Again, we were one of the first people here that day, so we didn’t have long to wait. The burger is a simple chargrilled burger with Roquefort cheese and served with The Spotted Pig’s famous shoestring fries. That’s it, there’s nothing more complicated than those ingredients, and yet, somehow, this burger and fry combo hit it out of the park. Let’s start with the burger. The bun was perfectly grilled, with even perfect grill marks on the bun. My husband loved the bread because he said that it held up well with the juices from the burger patty and didn’t get soggy or start to fall apart. Because the bun was grilled, it had good crunch, and was the perfect thickness to create a great meat to bread ratio. The Roquefort cheese was amazing, and surprisingly, not as strong as he had anticipated it to be. The flavors of the burger itself and the bread helped to dissipate the strong flavor of the blue cheese and added just the perfect amount of tang and creaminess to the burger. And the burger patty itself was perfectly chargrilled with a great char/smoky flavor. 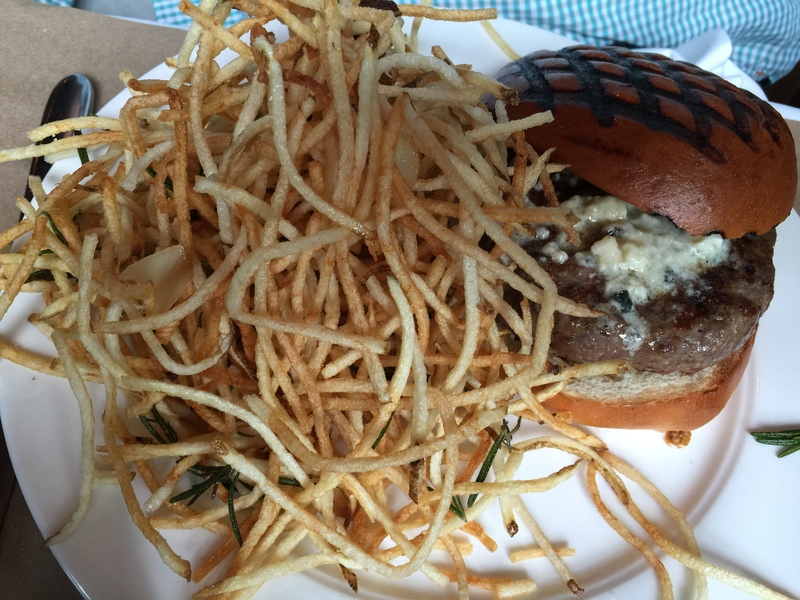 It was juicy and the flavors of the meat combined perfectly with the bun and the blue cheese. Now, let’s get to the shoestring fries. First off, how they ever even cut their fries this thin is beyond me. My husband is a fan of shoestring fries and absolutely loved this. Easily, the best fries ever. There’s no wonder The Spotted Pig has a reputation for their fries. The fries are perfectly fried, crispy on the outside and still tender and hot on the inside. They are tossed with rosemary leaves that are also thrown in the fryer with the fries. You can definitely taste a hint of rosemary in the flavor of the fries, and my husband even enjoyed eating the deep fried rosemary leaves. I don’t know how they do it, but you couldn’t ask for more amazing fries. The Spotted Pig deserves every accolade it receives for these fries. By the time we walked out of The Spotted Pig, we were completely satisfied. The gastropub itself was cute and kitschy and homey. The food was outstanding, especially the shoestring fries. What a perfect lunch this was, burger and fries and a bottle of beer that created nostalgia for my husband and amazing, tender short ribs for me. After having wandered around the High Line in the morning and walking through this beautiful Chelsea neighborhood to this cute little restaurant/gastropub, this was turning out to be a great day. What a terrific New York getaway. Great food, good atmosphere, terrific company. I can definitely see why The Spotted Pig has received a Michelin star for seven consecutive years. 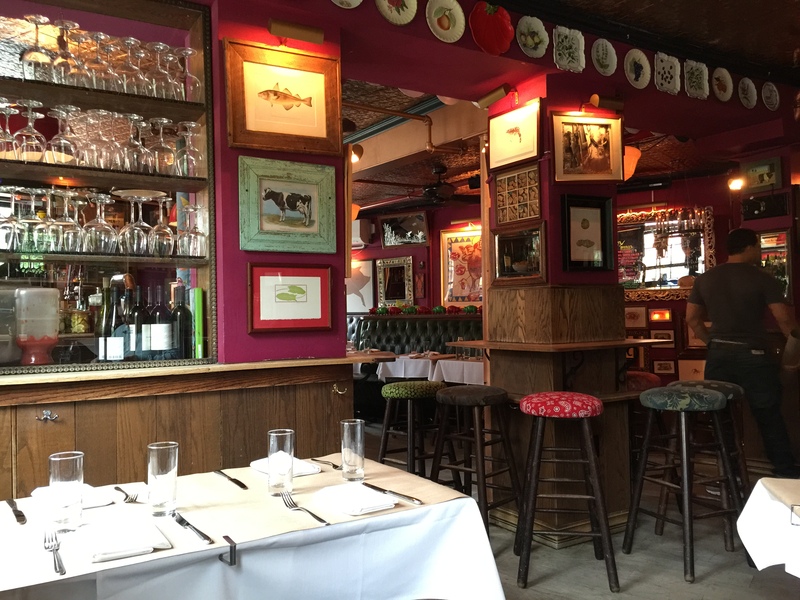 If you ever find yourself in Chelsea, take yourself to The Spotted Pig. You won’t regret it, I know we didn’t.